Amtech Air pinch valve require Air or liquid pressure is inserted in the cavity of AIR PINCH VALVE body- so,it control inlet collapses the internal rubber sleeve to provide immediate and positive shut-off. The rubber sleeve closes completely, even on large particulate matter, abrasive and corrosive materials.If we open, the sleeve allows full, unobstructed flow with little turbulence. Air pinch valve sleeves can be easily and economically replaced when they wear out. 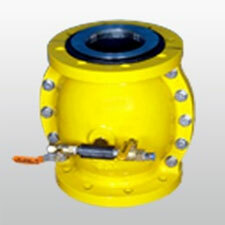 The sleeve material is specially design for abrasive slurries. The Air pinch valve is fully automated valve, with easy operation and maintenance. We recommad customer to order spare sleeve for any type of pinch valves so , maintenance can be done easily, it will also cost down , because no need to purchase the whole valve. WORKING CONDITIONS Flanged as per BS 10 table D /Table E,Table F, ASA 150# ,JIS/OR anyspecial. OPERATION Air operated with compressed air line, air pressure 4-6 kg/cm2 as per required.